The Detroit Zoo in Royal Oak will begin construction this year on a new wolf habitat, expected to open in 2015, following a $500,000 donation from Shery Cotton, a member of the Detroit Zoological Society, and her husband, David Cotton. 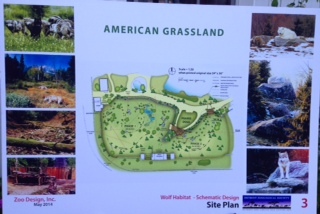 To be located at the zoo’s southwest corner, the design will include grassy meadows, trees, a stream and pond, wolf dens, and elevated rock outcroppings from which the wolves can survey their surroundings. In 1952, the Detroit Zoo sent four wolves to Isle Royale in the Upper Peninsula to be released as part of a program to re-establish the species. The society also endorses the Keep Michigan Wolves Protected campaign, which brings together conservation and animal protection organizations, Native American tribes, wildlife biologists, veterinarians, hunters, and farmers to conserve the state’s small population of wolves. The Cottons — along with sons Sean, Jon, and Michael — also donated the lead gift for the development of the Cotton Family Wetlands and Boardwalk at the Zoo. The zoo plans to raise additional funds for the wolf habitat at Sunset at the Zoo, a 21-and-older evening gala on June 13, which includes a strolling dinner, specialty drinks, entertainment, dancing, and live and silent auctions. For more information, visit detroitzoo.org/sunset. IN OTHER ZOO NEWS, Kagan says the $26-million Polk Penguin Conservation Center is on schedule to open late next year on 2.1 acres near the main entrance. The new exhibit is expected to increase the zoo’s annual attendance by at least 100,000 visitors while boosting its regional economic impact by several million dollars per year. In 2013, more than 1.3 million people visited the Detroit Zoo, which had a regional economic impact of $100.2 million last year, according to CSL International, an advisory and planning firm with offices in Dallas and Minneapolis. The penguin ‘deep dive’ — one of the attraction’s most dramatic features — will offer views above and below water as the penguins dive and soar through a chilled 326,000-gallon, 25-foot-deep aquatic area. The feature, which will be deeper and larger than the pool at the Arctic Ring of Life (the facility’s polar bear exhibit) will allow visitors to see penguins deep-water dive — something that cannot be seen anywhere else, even in nature. The bi-level, 33,000-square-foot facility, which will highlight the significant effect of global climate change, will be home to 80 birds. The staff is adding 20 Gentoos — a new species of penguin for the Detroit Zoo — from other zoos. “We want to make it as comfortable as possible for the penguins. The 60 penguins we have now have individual names (like Mad Dog and Nibbles). They’re really wonderful animals, and they’ll be getting quite a new home,” Kagan says. Once construction is complete and the penguins have moved into the new facility, the current exhibit, called the Penguinarium, will be renovated for a bat conservation center.